The Song Remains the Same. made द्वारा me :). Images in the Castiel club tagged: supernatural season 5 the song remains the same castiel. 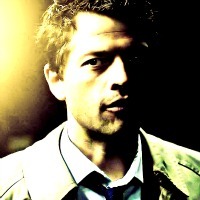 This Castiel icon might contain ऐडवोकेट, न्यायाधीश वकील, जज एडवोकेट, चित्र, headshot, closeup, हेडशॉट, and क्लोज़अप. Are आप there, God? It's me, Dean Winchester. Little Castiel ; A रात का खाना with the एंन्जल्स fanfic.